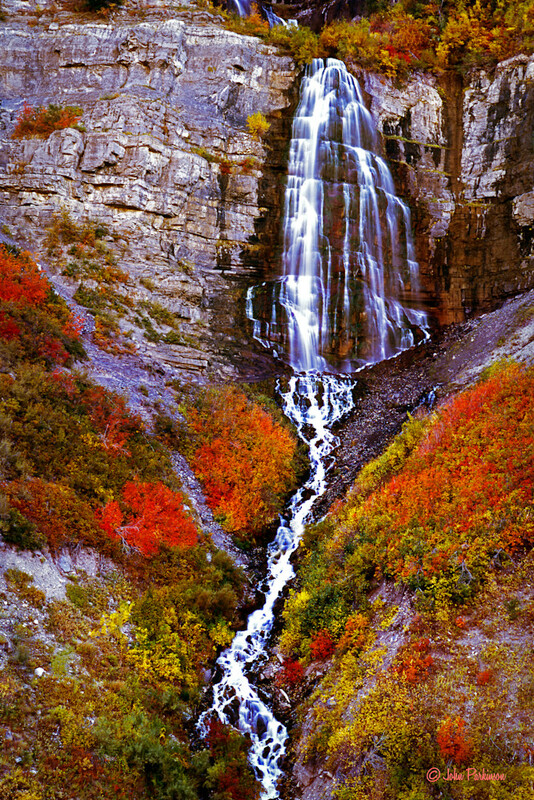 Bridal Veil Falls is a 607-foot-tall double cataract waterfall in Provo Canyon near Provo, Utah. It's great beauty attracts numerous visitors year around but my preference is to visit in the fall when it is adorned with colorful autumn foilage. Beginning in 1961 a six-passenger aerial tramway heralded as the "world's steepest tramway" serviced the top of the falls where "Eagle's Nest Lodge" and restaurant provided visitors with a unique "getaway" experience. In 1996 an avalanche destroyed the tram leaving visitors with only a steep trail to visit the top of the falls but, sadly, the lodge and restaurant are no longer there.